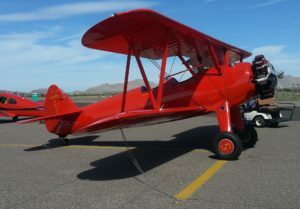 This is a two-seater aircraft, and the pilot usually occupies the rear seat, with the co-pilot / student/ passenger in the front cockpit. This nets a better weight distribution, since the plane has the huge 11 liter (680 cubic inch) 505 lb. engine hanging on the front. With the fuel tank located in the upper wing almost directly over the wheels, fuel load does not dramatically affect balance, but as a “tail dragger” proper distribution of weight is very important, especially on take-off and landing. 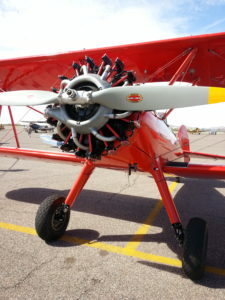 Originally, this plane was equipped with twin shoe drum brakes on the two main wheels, but this design was known to occasionally drop the upper brake shoe return spring into the lower actuator. Then, when the brakes were gently applied, that wayward spring could jam and lock the wheel, which could create a loss of control on the runway, and possibly a nose-over. 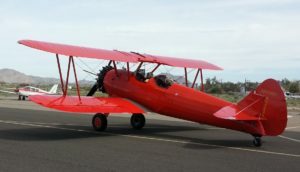 Therefore, during the restoration, this airplane was retrofitted with a much more reliable and progressive disk brake system. Upfitted as well, was an emergency locator beacon, a modern radio and cockpit communications system, and modern strobe lights. So, on with the story. As you might have guessed by now, I ultimately ended up with the immense privilege of not only getting a ride in this fabulous piece of art, but actually flying it! 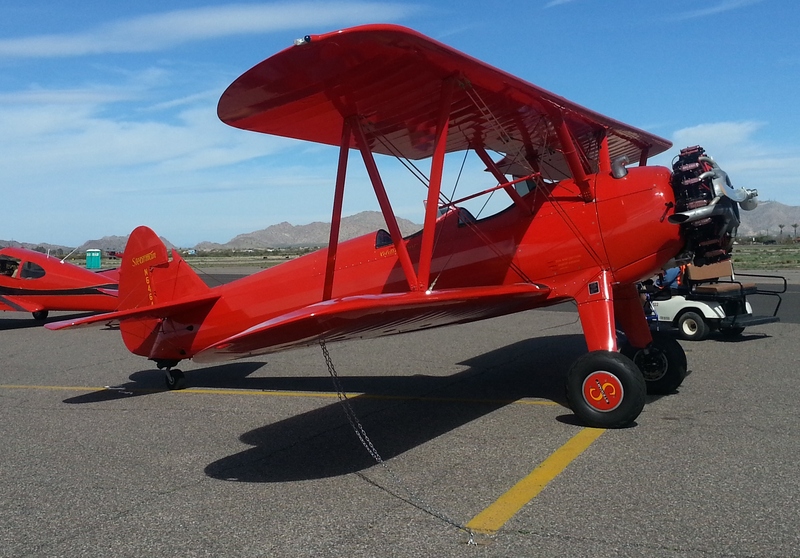 Although wind conditions were deteriorating, Tom Stewart, Jim’s son and curator of this craft, allowed me to take flight with ace pilot Kelly. Clamoring up onto the wing and trying to get into the front cockpit was an acrobatic feat for rotund and sedentary me. But, mission accomplished and five point harness cinched, the starter spun and the Lycoming roared to life. Off we taxied down to the opposite end of the field, and after the requisite run up, took our place on the runway. That’s me in the front seat, and although you can’t see it, I’m grinning from ear to ear. Lined up straight, the crankshaft spun up to 2150 RPM, the air-frame rushed forward, and we were airborne is mere seconds. We headed East, climbing to 2,200 feet initially, and then 3,200, once we were away from the bustling airspace of the fly-in. I tightened my grip on the control stick and first practiced maintaining straight and level flight. As soon as I realized how gently and naturally this big two-winged aircraft flew, I relaxed just slightly and reduced my corrective inputs to a minimum. I’m sure, anyone watching from the ground could have seen the change from pitch, twitch, and yaw, to smooth controlled guidance. You don’t fly this plane, you massage it through the air. As I looked back into the mirror on the underside of the top wing, I could see Kelly with both hands in the air, proving that I was, indeed, in control. Then, he told me that with his hands and feet a few inches from the controls, I could practice turns. Oh, what an incredible feeling, to make this magnificent machine respond to the input from my hands and feet. Of course, I made the rookie mistakes of slipping in the turns, loosing altitude by letting the nose drop, and exhibiting a general lack of smoothness, but with each turn, things improved. Adding some climbs and dives, I flew the airplane for nearly 15 minutes trough a number of attitude changes. Kelly, retook control, and then showed me some more advanced maneuvers. He demonstrated a few 45 degree banks, showed me what happens if you just try to turn by using stick only without rudder, and then proceeded to demonstrate a stall and recovery. He capped it off with a modified Immelmann turn, that was breathtaking. Looking out the right side of the aircraft mid maneuver, I was staring staring down at the ground almost weightless. Breathtaking. Sadly, since we had been flying for way over 30 minutes, we had to head back to the field. Lining up for the landing, wind conditions had shifted once again, and landing with an 8 knot tailwind just wasn’t what Kelly had in mind. So, the tower cleared us for an opposite approach, and we landed smoothly on runway 23, East to West. As I hoisted myself out of the seat and climbed off the wing, I still hadn’t fully comprehended the rare majesty of this old bird, and the reality that I had actually flown her. The crew pushed her onto her space, tied down the wings, and Kelly reached into the storage well to unroll a few shop towels to wipe down the front of the plane. I asked if I might have that privilege. As I walked around, carefully removing the traces of oil on the cowling and fuselage that had blown back from the engine during flight, and cleaning the oily dust and a few bugs off the red push rod tubes, the majesty of the craft and the immense luck that I had just had, fully sunk in. All the magnificent airplanes on display at the fly-in prominently displayed the typical, “Look all you want, but PLEASE DO NOT TOUCH” signs. 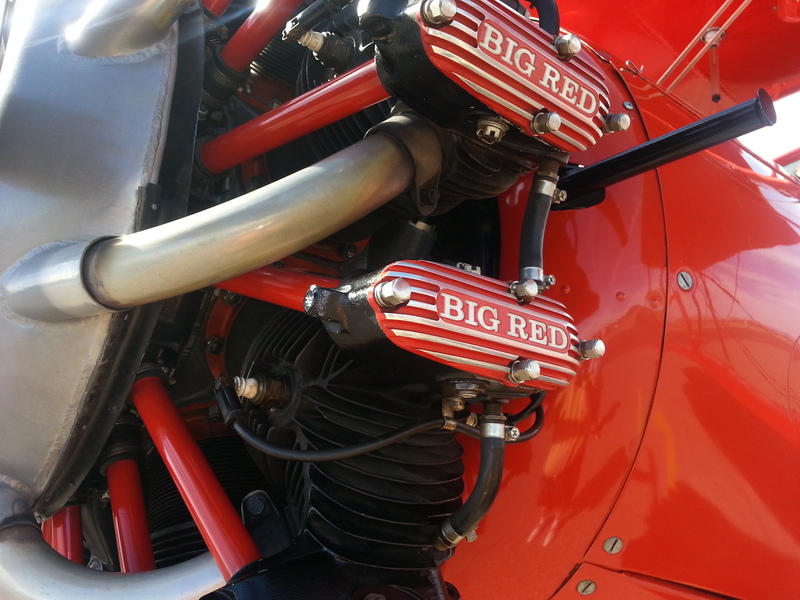 Here I was, privileged to polish this fabulous red monster with my own two hands, after being borne aloft, free of the earth, in all her open cockpit, wind-in-your face, glory. Nothing can compare. « Russian Hackers Are Everywhere!